The first Greek stamps appeared in October 1861, and they featured the profile of the ancient Olympian god Hermes. These Hermes Head type definitive stamps of Greece would be continued (in many variations) into the early part of the 20th Century. One may think that there is something very similar about the two stamps shown above. Well, there is! They are exactly the same! The central vignette was changed from the left-facing profile of Ceres to the right-facing profile of Hermes. The top and bottom tablets were changed to contain Greek inscriptions. 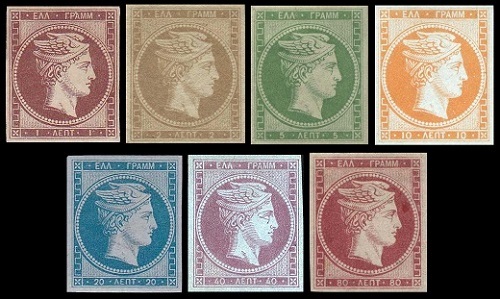 The seven Greek stamps shown above were produced in Paris and issued in October 1861. They are typographed on unwatermarked papers of various tints, and they are all imperforate. 01 L. (1861 - Fine - Sc. #1) - Chocolate on Brownish, Red Brown on Brownish. 02 L. (1861 - Fine - Sc. #2) - Olive Bister on Straw, Brownish Buff on Buff. 05 L. (1861 - Fine - Sc. #3) - Yellow Green on Greenish. 20 L. (1861 - Fine - Sc. #4) - Blue on Bluish. 40 L. (1861 - Fine - Sc. #5) - Violet on Blue. 80 L. (1861 - Fine - Sc. #6) - Rose on Pink, Carmine on Pink. 10 L. (1861 - Fine - Sc. #7) - Red Orange on Blue. In November 1861, the new plates for the first stamps of Greece were transferred from Paris to Athens, where their use was continued. According to the Scott catalog, there are three major types of the stamps of 1861-1862, as illustrated above. The differences are best seen in the shading lines on the cheek and neck. Faint horizontal or vertical quadrille lines are visible in the background of some of the Athens printings. The stamps produced in Athens after November 1861 and in early 1862 are known as the Athens Provisionals. The first printings were not very successful, and they are referred to as the Coarse Printings. An example is shown above, at the left. The later printings of 1862 were produced by a different method, and they are referred to as the Fine (or clear) Printings. An example is shown above, at the right. 01 L. (1862 - Fine - Sc. #8,8a,8b) - Chocolate on Brownish, Dark Chocolate on Brownish. 02 L. (1861 - Coarse - Sc. #9a,9b) - Dark Brown on Straw, Bister Brown on Bister. 02 L. (1861 - Fine - Sc. #9, 9c) - Bister Brown on Bister. 10 L. (1861 - Coarse - Sc. #10) - Blue on Bluish. 05 L. (1861 - Coarse - Sc. #11a) - Green on Greenish. 05 L. (1862 - Fine - Sc. #11) - Green on Greenish. 10 L. (1861 - Coarse - Sc. #12, 12c) - Orange on Greenish. 10 L. (1862 - Fine - Sc. #12a) - Orange on Greenish. 20 L. (1861 - Coarse - Sc. #13a) - Dull Blue on Bluish. 20 L. (1862 - Fine - Sc. #13,13b) - Blue on Bluish, Dark Blue on Bluish. 40 L. (1861 - Coarse - Sc. #14a) - Red Violet on Bluish. 40 L. (1862 - Fine - Sc. #14,14b) - Red Violet on Bluish. 80 L. (1862 - Fine - Sc. # 15, 15a, 15b) - Carmine on Pink, Dull Rose on Pink. There are additional varieties of many of the stamps reviewed on this webpage. Consult the various Worldwide catalogs or any specialized Greece catalog for further details. The early Large Hermes Head Greek stamps can be very complex and difficult to identify. When one buys any of these stamps, they should buy them from a dealer that has experience in cataloging and selling early Greek stamps. As with any collectibles of substantial value ..... forgeries of early Greek stamps do exist. If one is buying any expensive stamp of this era, one should make sure the items they are buying are guaranteed and / or certified. Hermes, in ancient Greek mythology, or Mercury, in ancient Roman mythology, was an Olympian god, the son of Zeus and Maia. 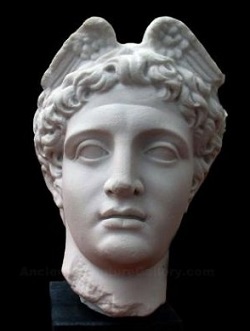 Hermes, in mythology, was primarily considered to be the messenger of the gods. He is described as being quick, cunning, and able to move freely between the mortal world and the world of the Olympian gods. Hermes was the protector and patron of herdsmen, thieves, oratory, literature, poetry, athletics, invention, trade, roads, boundaries, and travelers. The symbols associated with Hermes include a purse or pouch, winged sandals, winged cap, and the kerykeion (Greek) or caduceus (Latin). The caduceus consists of two snakes, wrapped around a winged staff, and it was the ancient symbol of commerce. It seems appropriate that the first postage stamps of Greece would depict the ancient Greek messenger of the gods and the patron of commerce. 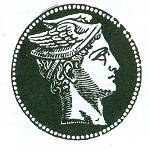 Over the centuries, Hermes, or his symbols have been depicted on both the coins and the stamps of many nations. He has also been depicted in art and sculpture, usually as the patron of trade and commerce.